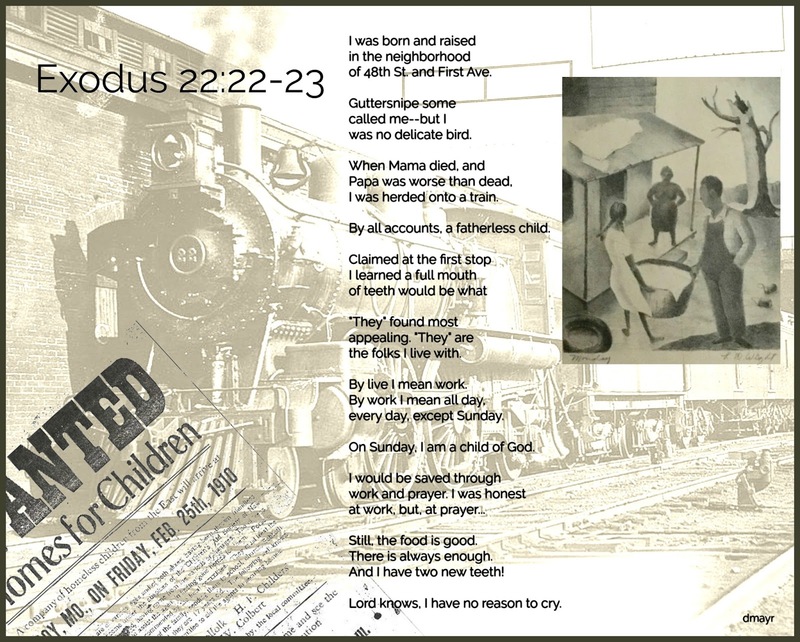 Random Noodling: Poetry Friday--"Exodus 22:22-23"
Linda Baie of Teacher Dance owns a pencil drawing that had belonged to her grandfather. It is signed by L. D. Wight and is from the early part of the 20th century. The drawing was used as a writing prompt. Linda has given permission for the picture to be posted and I've included it in the illustration for my poem titled "Exodus 22:22-23." 22 You shall not mistreat any widow or fatherless child. of 48th St. and First Ave. I was herded onto a train. By all accounts, a fatherless child. the folks I live with. By live I mean work. On Sunday, I am a child of God. Still, the food is good. And I have two new teeth! Lord knows, I have no reason to cry. Learn more about the film and the orphan trains, visit http://westbyorphantrain.com/. Please visit Michelle at Today's Little Ditty for the Round-Up of this week's poetry links. Wonderful poem! That event really amazes me. And so complex, too. Rounding up the children, making arrangements with towns to accept them, putting them on trains, etc. You have such a beautiful poetic voice, Diane. But what a sad scenario that video portrays. The complete film, too, is overwhelmingly sad, but there were some successful placements. Very moving, Diane - you have such a gift for these kinds of poems, and illustrations too. Thanks for sharing the video. The complexity of these kinds of issues - the imperfection of solutions and yet the heart of those who tackle suffering - rings through it. It's always a fine line between helping and hindering. I'm glad to see another idea for a poem about this picture, Diane. Sad to think of those children, surviving as best they could, in the city and in those new homes, often not a good change after all. A relative of a relative was one of those children, and I talked with her a long time ago. She was terrified she told me, but did "land" in a better home than most, grew up to have a good marriage and children, one of whom married a cousin. Thanks for giving sympathy to those children in your poem. Thanks for the original inspiration picture, Linda! And how interesting about your connection to one of the children. What a poem, Diane! I envy the skillful way you're able to pull story out of a picture, a video, a piece of art. Like Robyn said, it's a gift. Not so much a gift as an active imagination! There have been incredibly difficult times in the past. Sometimes I wonder how we would handle similar situations today. I loved this piece. Interesting thought, Donna, how would we handle street kids today? Thanks, Jama. It was fun looking for items to use--that newspaper ad was perfect. Yay, Wikimedia! Fascinating, Diane. The reality is, for most kids, it was being motherless that really sets kids adrift. So many kids are already without their dads. So sad to consider what some children had to go through years ago..yet here in the 21st century, and many still don't have it any better. I did a little reading and it seems that drug addiction was also a problem in the cities in the early 20th century. The more things change, the more they stay the same. What a powerful voice, and oh what a sad reality for so many little ones. That little girl of my imagination spoke to me, and, I have no doubt her pluckiness would save her. Your poem really took me right there, Diane. I have so many questions about this poor child. I have a feeling she found some happiness not long after this. At heart I'm a glass half-full type of gal. Fascinating blog as usual, Diane. I have always been intrigued by the orphan train story. You connected ideas that I would have never thought of so beautifully. I am going to share your blog with teachers in my PD series so they can see how to weave ideas together with thoughtful intent. I'm a curious person, so I'm always trying to satisfy my curiosity, rather than being thoughtfully intentional. I hope, however, sharing my post with teachers will be of use. That line, "And I have two new teeth!" breaks my heart. Such young children working 6 days a week. Oh, Mary Lee, the stories of what children endured before child labor laws were enacted would curl your hair. Kids on farms never received all the protections factory workers did, so, for those orphans who were selected because additional "help" was needed on farms were not always treated well. It really is heartbreaking. Very moving poem Diane, I appreciated it when it was posted on Laura's site, and again here. The video you shared adds an extra layer of depth to it too, thanks for sharing it with us. Seems like we could use a better place for young boys and girls still today.